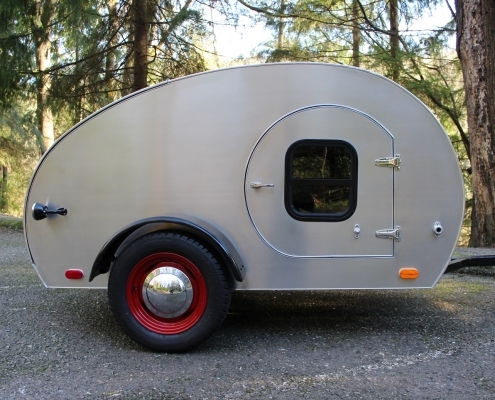 Just in time for summer, make your own custom teardrop trailer! Perfect for summertime road trips and camping by the river. This SoCal, Can ’em Danno inspired teardrop trailer is the quintessential summer accessory that can be used all year. 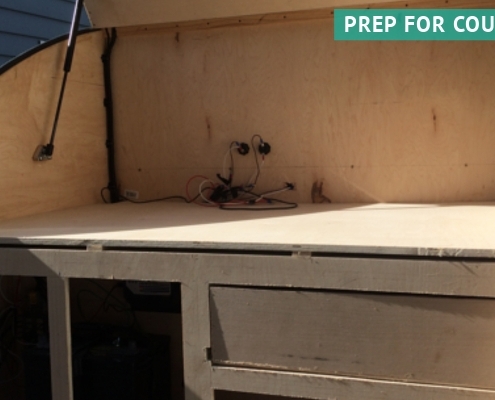 Follow the step-by-step instructions to build your own aluminum teardrop trailer. Winner of the 2017 Ingenuity Awards presented by Online Metals. Garrett’s ingenuity is truly inspiring. 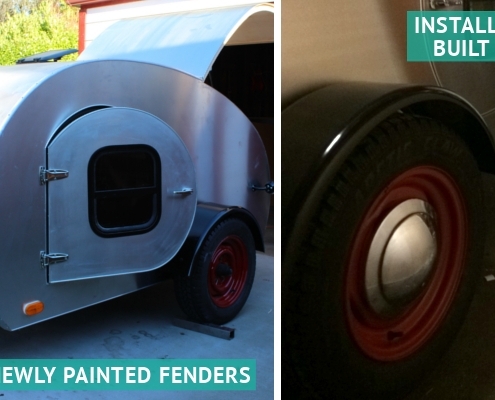 This how-to is based on the Can ’em Danno & SoCal inspired teardrop trailer designed and built by Garrett Myhre. Using Online Metals materials, Garrett created a high functional and amenity-filled masterpiece. And by following his instructions, so can you. Or use this as a guide to inspire your own one-of-a-kind camper creation with features unique to your needs. *Lengths may depend on your particular design or if you choose to refurbish an old trailer. 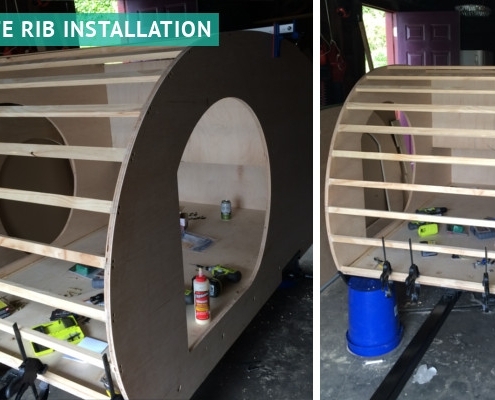 To build a 4’ x 7’ trailer as illustrated below you will need: two 84” lengths, three 48” lengths and two 30” lengths. 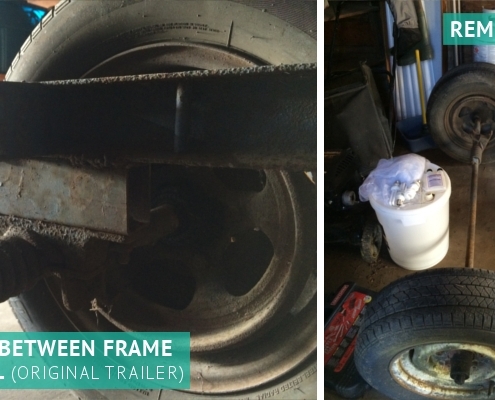 **The spacers fit between the axle and the frame and the length may depend on the trailer you start with. First you need a frame to design your trailer around. You can start from scratch or try an easier route by finding a previously owned utility trailer and using that as a starting point. Garrett purchased a 4 x 6 utility trailer on Craigslist for around $200. The frame was badly bent but the torsion axle, hubs, wheels and fenders were all in pretty good condition – plus it came with a clean title. Garrett removed the axle from the original frame and built a new frame from scratch. 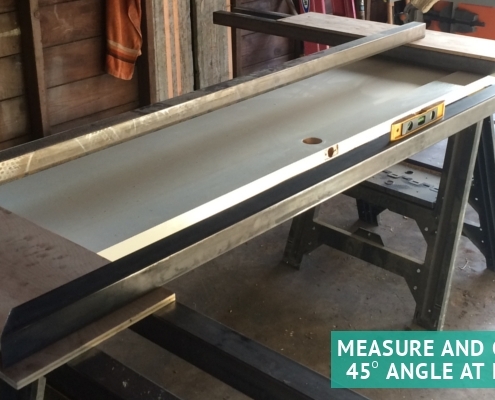 Using 2″ x 0.12″ A500 Steel Square Tube, cut the desired lengths, based on your design, with 45 degree angles at each end. 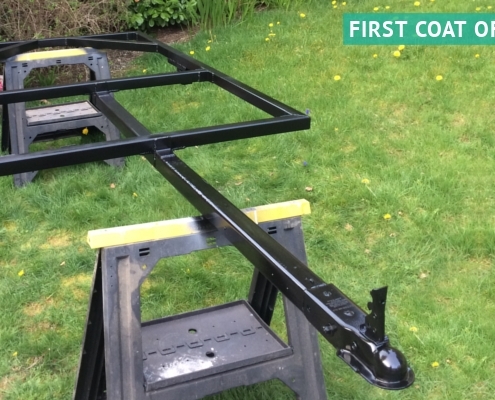 The new trailer frame for this project kept the width of the original base, 4-feet, to allow for the use of the original axle. 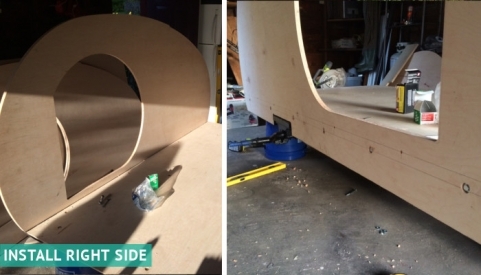 The length of the new frame is 7-feet to accommodate the design of the trailer (see step 4). Weld these pieces together to form the new frame. Test the fit and attach axle to frame using 1″ x 2″ x 0.12″ A513 Steel Rectangle Tube to create the spacers between the frame and axle, join by welding. Remove the hubs and set up your frame in a well ventilated space. Wipe down the frame to ensure you are starting with a clean surface. First apply a coat of primer and let dry. Then apply two coats of enamel paint in the color of your choosing (Garrett picked black). Be sure to allow each coat to dry fully before starting the next coat of paint. 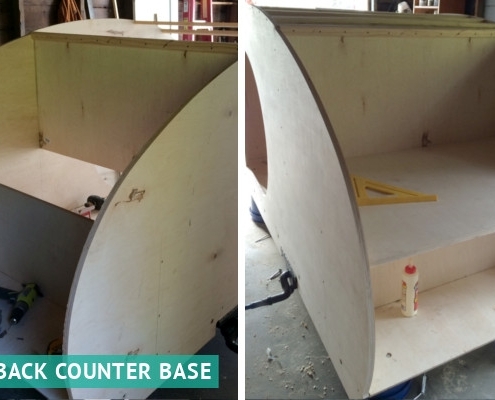 Cut a plywood sheet to fit the dimensions of your new trailer. In this case the base was 4’ x 7’. This will be your floor board. Be sure to coat the exposed underside of your floor board with a protectant before fastening it to your frame. Garrett suggests 2 coats of marine epoxy and black enamel. 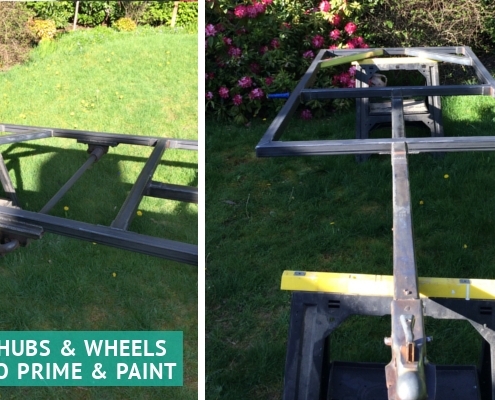 Drill holes into the frame and use carriage bolts to fasten the floor board onto the frame. Garrett designed the shape and templates using CAD software – designing just enough to create the sides, ribs, and researched several trailer designs and was drawn to the 1950′s style lowered teardrop look. Use CAD software to design CNC machine files for the sides, supportive ribs, and floor of the trailer. 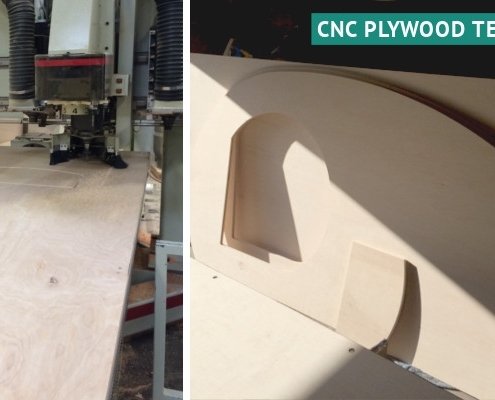 After the design is finalized cut templates from plywood to your specifications using a CNC machine. Garrett used a 3 axis CNC machine. If you do not have access to CNC software or a CNC machine try a local machining house. They will be able to assist with the CAD design and cutting. Or, depending on your talents, you could draw and cut the templates by hand. 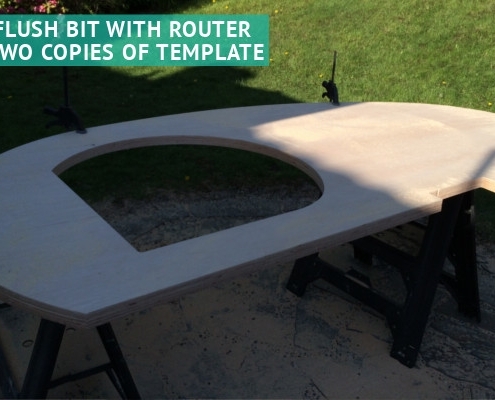 Using a flush bit with router, create two copies of your templates to use in the actual trailer build. Coat the areas that will be exposed with marine epoxy to protect from the elements. 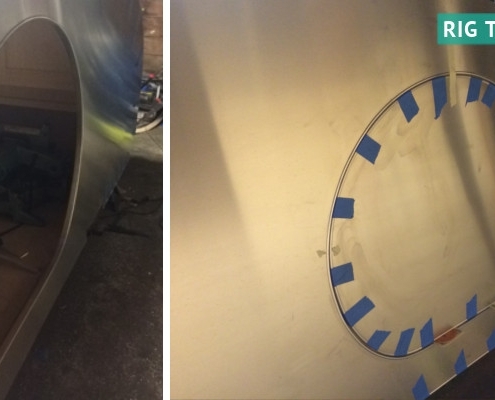 Once the templates are cut, coating the areas that will be exposed with marine epoxy to protect from the elements. Assemble the plywood template pieces together starting with the sides then back walls. The cut of the back wall is the most crucial the structure of your trailer, so be extra attentive to that area. Create ten forwards ribs that run parallel to the floor, securing each end with two bolts and install the upper wall. 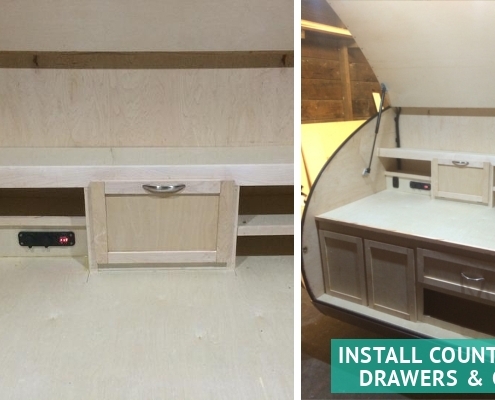 Install the back counter (if applicable to your design) and complete the installation of all forward ribs. 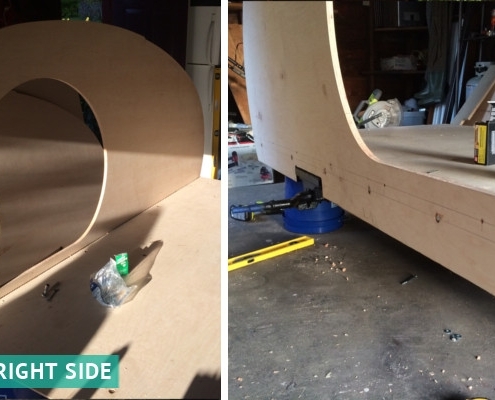 Install 1/8″ birch plywood as the inside skin with adhesive. Compress the adhesive until dry to ensure a strong hold. Then install 1″ rigid foam between all of the forwards ribs. Build interior shelving and install lighting. Feed all electrical wires through the back. The back ribs follow a square pattern that is simple to assemble when done properly in CAD. 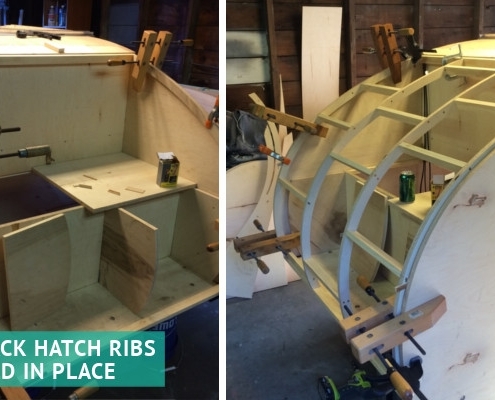 After the ribs are secured, install 1/8″ birch ply inner skin. Lastly, use the 1/8th inch plywood to bond an outer skin to the trial. Back hatch and locking mechanism. Install roof window hatch. Finish by sealing the outer plywood skin and prepare the hurricane hinge. “Back hatch ribs aligned to be built in place. The ribs were routed from the template that was CNC machined. 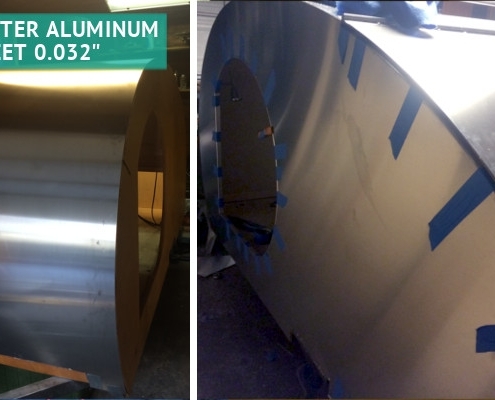 Using 5052 Aluminum Sheet (0.032” thickness), bond an aluminum outer skin to the plywood skin. Use a hurricane hinge to fasten the sheet together. 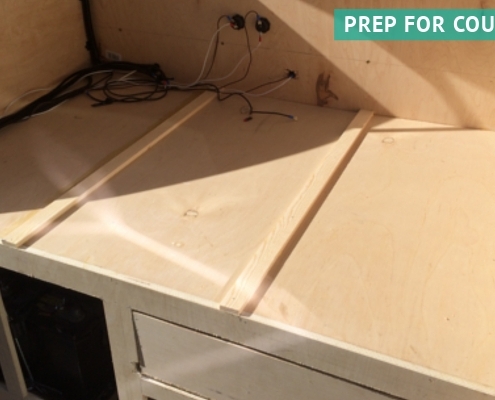 Use the 5052 aluminum sheet to create an outer skin for the sides and doors of the trailer as well. Bond the Aluminum door cutouts to the plywood door cutouts. Rig both the right and left door to ensure a good fit. Cut out and install windows to the desired shape in each door. Garrett used pre-fabricated windows that slide open halfway and have screens to keep the bugs out. Attach each door with hinges. To create the door jam attach a 1/2″ routed piece of plywood to the inside of the door openings. Line the plywood with an edge seal and add a fillet seal to complete the door jam. Install door latch mechanism. 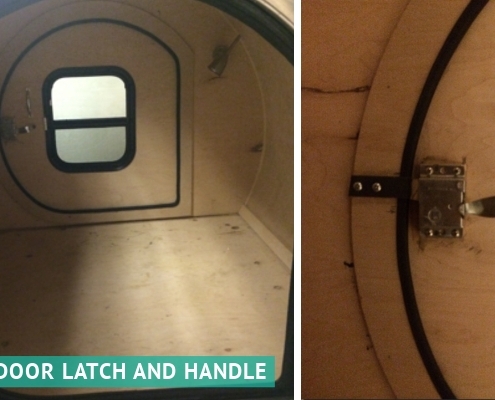 Complete the installation of the hurricane hinge for the back hatch. And secure the aluminum sheet with trim along the edges, spacing your screws evenly. Prime the original trailer wheels wrapped in new 205 65r15s and paint two coats of your desired color. Be sure to let each coat dry before starting the next. Fit the original fenders and weld new brackets. Paint fenders and mount directly to the side of the trailer. Install hubcaps. Install and test taillights and side exterior lighting as well as the interior lighting. 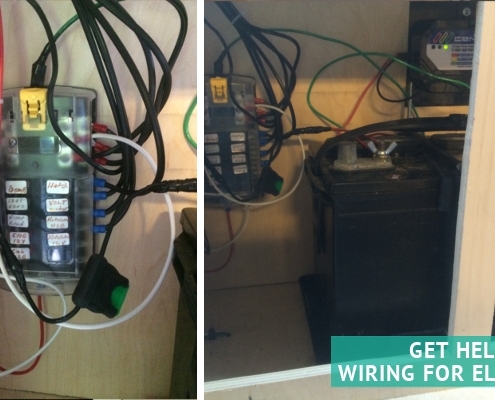 If you are an electrical wiz, you can hook up wiring for all electrical needs yourself. This electrical wiring was setup with help. 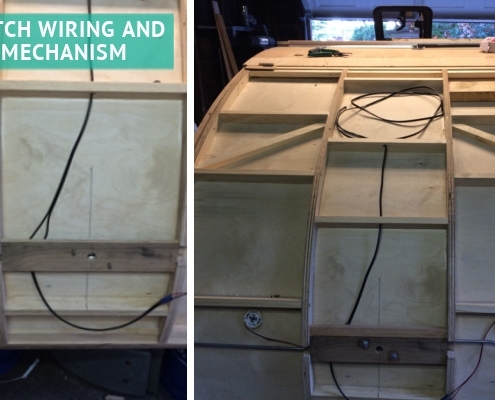 The battery and wiring is housed in the back under the counter. Finish installing the back hatch counter, feeding the electrical wiring through for counter outlet, cabinets and drawers. The back hatch countertop is the perfect opportunity to customize. Try a copper countertop using copper sheet. Or use galvanized steel. Hook up and hit the road! Do you have a project you would like to share? Is your business working with raw material metal or plastic in creative, unique, or inspiring ways? Then we want to feature you! Receive recognition and share your skill with our community of craftsmen, fabricators, engineers, designers, artists, hobbyists, and skilled professionals. Contact us on Facebook or Twitter and you could be our next Elements of Ingenuity or DIY honored feature article!